Volume 2, Get Over Yourself, expands the cast with dwarf blacksmith Bedelia joining Adrienne’s quest to find Princess Angelica, the most beautiful in all the kingdom. 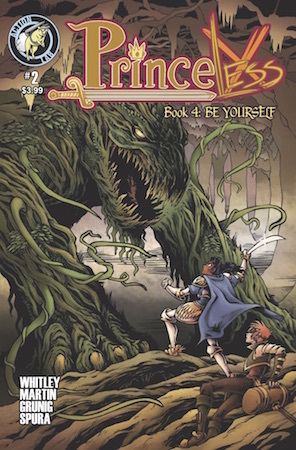 Volume 3, The Pirate Princess, takes a detour, as Adrienne helps Raven Xingtao, the daughter of the Pirate King, get her revenge on her brothers, who had her removed as heir. Raven has since gotten her own series. Now here’s Volume 4, Be Yourself. Jeremy Whitley writes and Emily Martin continues to illustrate the latest adventure, in which Adrienne and Bedelia attempt to rescue another sister, Angoisse. However, Sparky’s crash in a swamp means the characters wind up separated, with the women captured by goblins. We also see more of Adrienne’s brother Devin. In the same way she is a better fighter than a traditional princess, he also wants to break out of his prescribed gender role, since he’s an excellent tailor. Unfortunately, King Dad is a harsh taskmaster and a ruthless disciplinarian, with little patience for someone not like him. The cast is beginning to sprawl, but the variety of character types allow for a little bit of fighting, a couple of comedy scenes for humor, some exposition, and a bit of suspense in each issue. Devin is surprisingly observant, so he’s going to investigate his mother’s disappearance as a detective in training, helped by Kira, a courageous young werewolf. He’s also a good source of vocabulary expansion, since kids reading some of his dialogue will need a dictionary to follow along, as when he says (to his horse), “She’s a bit pugnacious… having someone a bit rugged and truculent along may be just the–“. 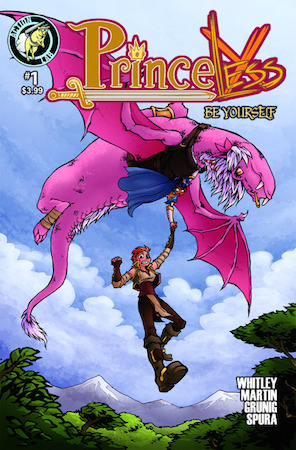 Princeless is rather like a salad bar, with something for everyone and a changeable structure. Like bad weather in the Midwest, if you don’t like something, wait a few minutes (pages) and something different will come along. I would rather read a more focused story, myself, but they’re aiming for younger readers, with shorter attention spans, which may explain why scenes last at most three pages before they jump to somewhere and someone else. Issue #2 gives us more with the goblins, who are firmly in the tradition of a tribe of fantasy creatures who exist for comic relief. The girls are terrified that they’re going to be eaten by the “monsters”, but the little green guys, while spouting mangled language, turn out to be the victims of a phrasing misunderstanding. I found them silly fun. We haven’t even seen Angoisse yet, halfway through the series, but Adrienne and Bedelia have picked up a new guide in their continuing quest. And Kira is a terrific addition to Devin’s storyline, one I want to see more of. This issue is strongly comedic, which I enjoyed, although there’s also a battle. The scenes are slightly longer, with more running four pages, which deepened my involvement in these characters’ interactions and struggles.